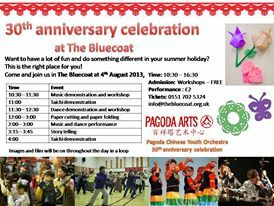 Members of Pagoda Arts will be celebrating our 30th anniversary of the PCYO at the Bluecoat Arts Center on the 4th August. Come down and join us . Find out the history of various musical instruments, try them out and find out how they sound like. Or try out various taichi forms, double fan, and dance. paper folding or paper cutting, stories from ancient China. A fun family day not to be miss.